Trek Update: we have finished our 2014 Trek. visiting our crook mate in hospital in the CBD of a capital city. The movie is now in production but if you want a taste of what we did you can find it here. Trek Update. We are doing it Now! Disregard the plan listed below, we are doing itdifferently! The trek throws up a lot of different twists and turns and so we are following a different trak. Catch up with the latest at the Trek-Blog or here for the photos. The Trek for 2014 - is underway! Highlights will be going back along the Anne Beadell to Emu, but then continuing on to Voakes Hill Corner and then down to the Great Australian Bight. Anne Beadell Highway near Emu, 2013. What's next for the TTT Team? Well. planning is well underway for our trek in 2014. We had a location picked out that was well, well off the beaten track as they say. Negotiations for access weren't fruitful for this year, so Plan A will go on the back-burner and become a plan for another day. Time to pull out Plan B! Plan B swings into action, and it sees us swing back into South Australia, that state we love! At the risk of offending, we are starting to really believe that South Australian's are not proof that Tasmanians can swim! Anyway, back to the trak. 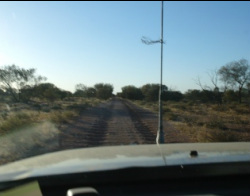 Plan B sees us going out the Anne Beadell Highway again, but instead of turning down to Maralinga, we will continue on to Voakes Hill corner, then come down to Cook on the Trans Australian Railway. From Cook we then go down to the Great Australian Bight. We will return along the coastline through Ceduna.